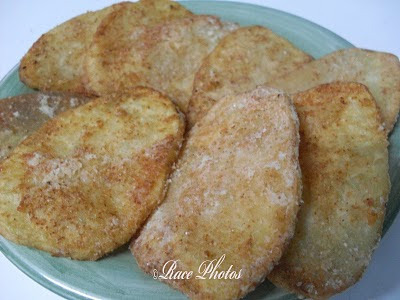 Here's sharing my kids' favorite snack, my version of Mojos. It's basically potatoes cut in thin circular shapes and sprinkled/dipped in cheese breading. Then deep fried in hot cooking oil. I haven't included a picture of our dip sauce which is a mixture of mayonnaise and banana catsup. Why I call it mojos? Because I love Shakey's Mojos and when I can't eat there I just make tons in my kitchen, yes tons of this as it's really yummy! Forgive my not so good capture as the cam is not in its good shot lol! Trouble with lighting I think! I'm rushing now to fix the picture! You can try this 5-minute recipe of mine, don't forget a bottle of your favorite drinks here! never tried mojos before, mukhang masarap ah..try ko nga magluto. who can say no to mojos?! wonderful snack. waah!!! how how??? pano yung cheese breading sis? wala pa akong nakita nun dito ah.. i want! i want!!! Want to Sell Some of your Gold Coin Collections?